Hob Nob Anyone? was one of the first football sites to hit the web. We are probably the oldest football website still running without any interruption. When the site was first launched in November 1994 only a handful of clubs were lucky enough to be represented on the Internet. 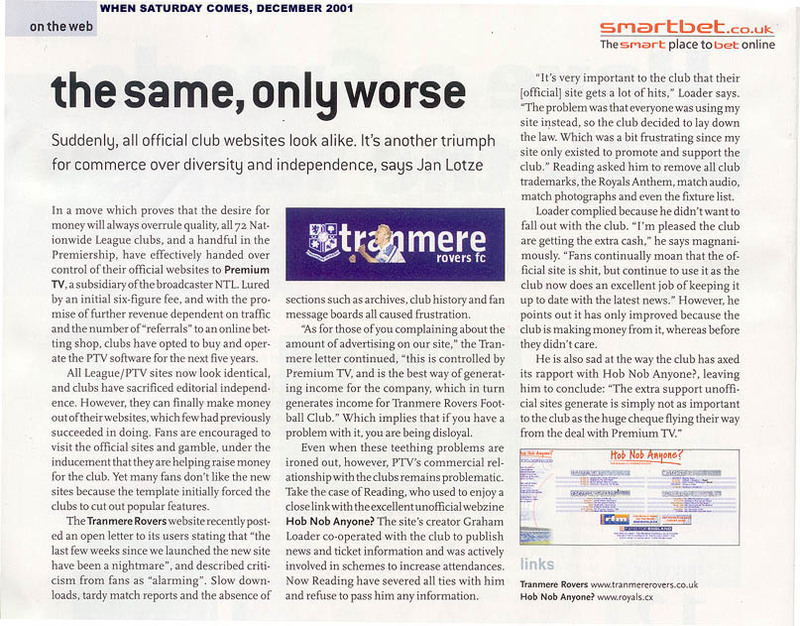 In the early days we were used by Reading Football Club as an outlet for news and ticket information. We were then involved in the build of the first official website until a large corporate deal was struck between the Football League and NTL. Since our inception over 20 years ago we've seen two promotions to the Premier League. We never thought we'd see that. The Royals continue to provide plenty of inspiration to keep the website fresh with news and fans opinion and discussion. Hob Nob Anyone? was hosted at the University Of East Anglia from 1994 until the summer of 1996 when it made the move to VIA NET.WORKS - who hosted the site until 2002. Early in 1999 this site got it's own domain name ( royals.org) and moved to it's own server. In the summer of 2002, Hob Nob Anyone? moved again to be hosted at Oscura Ltd. Oscura are a local web development and hosting company in the centre of Reading. The website currently (as of February 2014) produces 1.5M page views and 200,000 user sessions (45,000 unique users) a month. All those who have sent in match reports, match opinion and all news items, with any luck I should have given you a credit with the article you sent. Oscura Ltd for domain name services and hosting from June 2002. The University Of East Anglia for hosting this website from November 1994 until June 1996.
i-way for their sponsorship, and website hosting from June 1996. 2-TEN FM / Classic Gold who sponsored this site from 1997 until 2000. Future Publishing who sponsored this site from 2000 to 2001. Alex Donaldson, Tony Ella, Malc Leary, Phil Newton, Chris Bennett, David Spencer, Jeff McFee, and Steve Rudd. The playing staff at Reading Football Club who provide all the inspiration for this site. And thanks to everyone who looks at, and supports, this site. Featured weekly on Meridian ITV Teletext during 1998/1999 and 1999/2000 seasons. 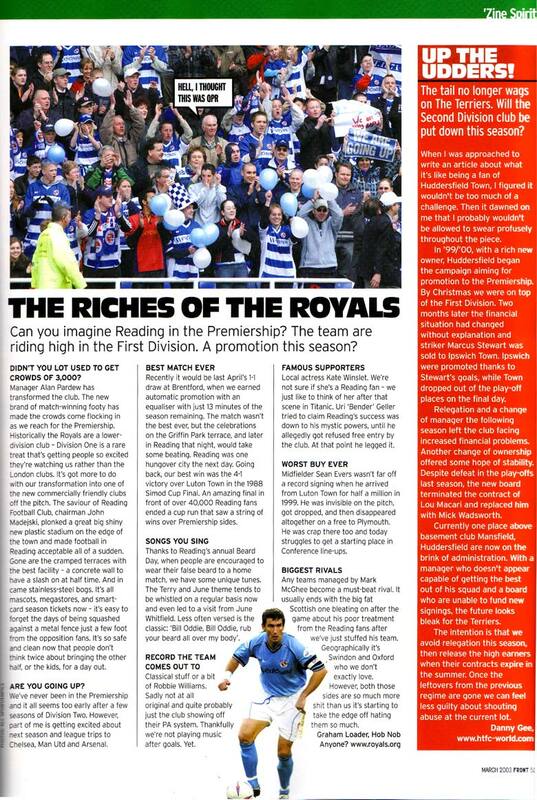 We were awarded the STAR (Supporters Trust At Reading) 2010 award "for services to supporters of Reading Football Club"
Featured in 'Concrete', UEA's own newspaper! Please don't hesitate to get in touch should you wish to voice your opinions on this fanzine site or to contribute (either a one off or regularly - all input is welcomed!). All regular contributors will be rewarded in some way - although we can't promise much! This website site is not the official Reading FC website. 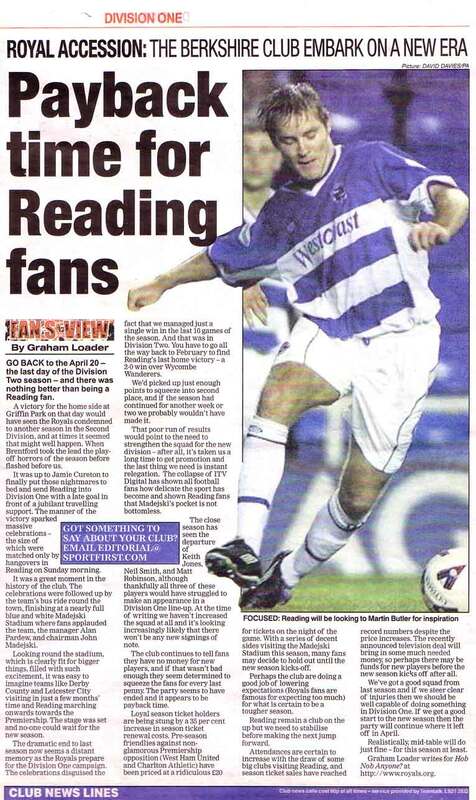 This internet fanzine is a service available free of charge to all Reading FC supporters out there and anyone else who stumbles across these pages. 'Hob Nob Anyone?' is unofficial and the views expressed are nothing to do with Reading FC, the University Of East Anglia, Classic Gold, I-Way, VIA NET.WORKS, or Oscura Ltd in any way. The views are those of supporters and contributors.